We met… January 2013. In the local pub, Blue Bar. Mal was at a friend’s party and I was out with the girls. A mutual friend introduced us. We’re from the same town but our paths never crossed. Our proposal… We brought the dogs for a walk one Sunday and stopped by Mellifont Abbey outside Drogheda. It started lashing rain (same as our wedding day!) so we had to take cover for a while. When the sun came back out we continued our walk with two soaking wet dogs and Mal produced the ring when I was looking around the ruins! Our wedding theme/colours… We didn’t go by a theme as such. I only had one bridesmaid and her dress was navy so I went for very soft, pastel flowers to compliment the dress. Elizabeth Cott from Wonderous Weddings was fantastic. I told her my idea and left everything else completely up to her. Things we DIY’d/made ourselves… We did the sweet cart ourselves, which was still on the go at 4.30am. I think we went slightly overboard with the quantity of sweets we had! We made bandanas for the dogs, ‘Dog of Honour’ and ‘Best Dog’. We put together other small little things like gift boxes for the bridal party and baskets for the bathrooms etc. My dress…. I bought my dress in La Bella Sposa. Leila and Aine were amazing. It was my 4th shop to go to and I recommend it to everyone now! They didn’t put any pressure on me and they waited to see my reaction first before they commented on the dress which I think is really important!! I went there on my own because I wanted it to be my decision and not influenced by the reaction of my mam, bridesmaid or friends. Of course I brought my mam and bridesmaid back to show them but at that stage the decision was already made! My hair and make up… Thankfully Rebecca Todd agreed to travel to Cork for my make-up. She is incredibly talented!! Susie Keane from Cork did my hair. I found her through weddings online and from the very start she was just amazing! She was so easy to contact, listened to exactly what you wanted and at every step during both the trial and on the day made sure you were happy!! His suit… The suits were bought in Monza Menswear on Dawson Street. They knew exactly what Mal wanted and, even more important knew exactly what he didn’t want. What our bridal party wore… My bridesmaid wore a dress from TFNC which I got on Asos. I picked the colour but told her she could pick the dress. She described what she had in mind and while I was getting ideas online found a near perfect match to her description. She looked beautiful! Our ceremony… This was all changed on the day!! We had Jean Noonan from Spiritual Ceremonies as our celebrant. She was lovely, such a genuine person and so easy to get along with. Our ceremony was supposed to be held outdoors. When we booked the venue we were told this was possible. We laughed because as we live in Ireland didn’t think it would be likely! However, with the summer we had in 2018 we started getting more and more confident that it was possible! We woke that morning to constant rain!! It was probably one of the only days during the summer that it rained!! It didn’t matter to us though! We had our ceremony indoors and it was perfect! We chose our photographer because… I actually met our photographer at the RDS Wedding Show. He completely sold himself! He was full of chat, was good fun but still knew how to get the job done and wasn’t afraid of giving direction! We chose our videographer because… Originally we weren’t going to have a videographer but coming up to the wedding we decided to look into it. Best decision we made!! We found Alan through weddings online and both him and Brid were a pleasure to deal with. Looking back we were so lucky that they were free on our date!! They were so friendly but still so professional and did an incredible job! 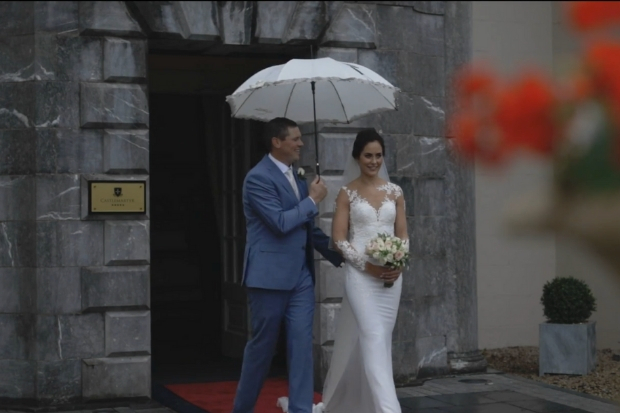 We chose our wedding coordinator because… Castlemartyr have their own wedding co-ordinator and we were beyond blessed to secure Jackie Day for our wedding. She is exceptionally good at her job! No request is an issue for her and she completely made our day! 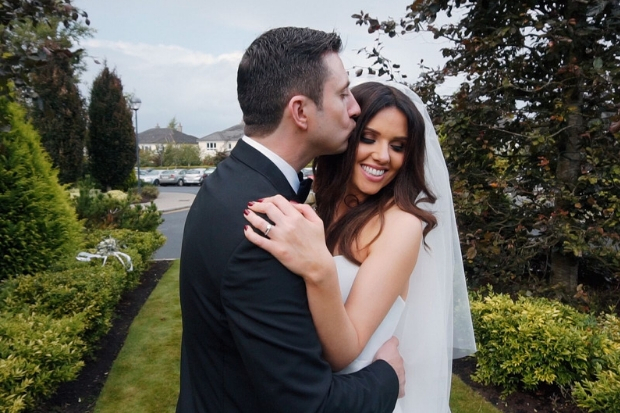 We chose our venue because… We went to Castlemartyr for a weekend 2mths before our engagement. We fell in love with the place. The grounds, the staff, the rooms – it was amazing. We both agreed that we’d love to get married somewhere like Castlemartyr. A huge bonus for us was that it was also dog friendly! We actually booked our wedding before we officially got engaged!! We had been ring shopping and picked a ring. I just didn’t know when I was going to get the ring!! We had decided we’d like to get married the following summer and when we contacted Castlemartyr they only had one Saturday available in the summer so we had to meet with them!! It was my dad’s birthday and we were all going out for a meal that night but myself and Mal had to make a round trip to Cork that day and keep it a secret! Jackie wasn’t available that day (which we knew) but we met with Trevor Sheehan, the guest relations manager. Upon meeting Trevor we knew immediately that we had to secure the venue! Everything about the venue is incredible but the staff really make it!! We knew it was a long way for our guests to travel but we hoped they would understand why we chose Castlemartyr once they had visited. We got engaged a week after booking the venue!! Our menu… I’m still trying to recreate some of the dishes… the food was delicious!! For Starters we had Beignet of Pork Belly and Black Pudding. The soup was Potato and Leek. We had Steak with a Mushroom and Spinach Pithivier or Seabass with Pearl Barley, Tomato and Basil for the main course. Dessert was White Chocolate and Raspberry Cheesecake with Raspberry Sorbet. Our honeymoon… We waited for 3mths and then went to Secrets The Vine in Mexico. Complete luxury for two weeks lying by the pool!! My favourite part of the wedding day… I loved every second of our day and I couldn’t pick just one!! I loved when my dad walked me up the aisle and myself and Mal saw each other for the first time. And I just loved our first dance!! My friend is a dance teacher so he helped us put something together. We told no one so no one expected it! We even got a little lift into the routine, which was practiced at 1am the night before the wedding!! My piece of advice for other couples… Just enjoy every second of the day!! Not everything will go as planned. We hoped for our outdoor ceremony but we had no say in the weather. We just about got a couple of photos outside but none of it mattered! Our day was perfect to us.